Bobbi Kristina Brown, 22, the only daughter of singers Whitney Houston and Bobby Brown, died Sunday, nearly six months after she was found unresponsive in a bathtub of her home, her family said. Brown has been unresponsive in hospitals and hospice care since she was found in her Roswell, Georgia, home on Jan. 31. Her family said she suffered irreversible brain damage. 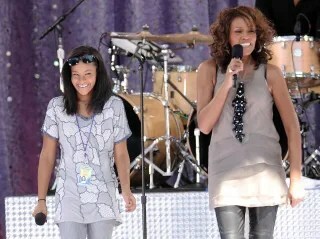 Bobbi Kristina was music royalty as the daughter of two superstars — and the granddaughter of another, Cissy Houston, the mother of Whitney, who died in February 2012. Police have said that they investigated the case as a medical emergency and that no foul play is suspected. No criminal charges have ever been brought. But late last month, Brown’s conservator sued Nick Gordon — who has been described as Brown’s boyfriend and husband, an attachment her family denies — for $10 million, accusing him of having physically abused Brown and having improperly withdrawn $11,000 from her bank account after she was in a coma. This was reported via NBC.